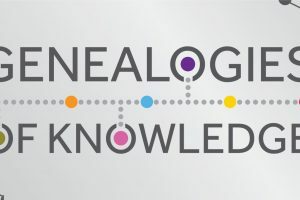 The selection of abstracts for the Genealogies of Knowledge I conference has now been completed. Approximately 40 papers to be delivered under one of the nine thematic panels that were submitted for the organisers’ consideration. We are delighted by the positive reception that our Call for Papers has enjoyed, and by the high quality and diversity of the proposed presentations. We hope you will agree that this promises to be a very exciting conference indeed. The EARLY REGISTRATION period is now open, and will remain so until 20 September 2017. A STANDARD REGISTRATION date will be available after that date. As part of the booking process, you will be asked whether you would like to attend the Conference Dinner (8 December). The Conference Dinner (£45) is not included in the registration rate. As part of the registration process, you will be asked whether you have any specific dietary requirements.